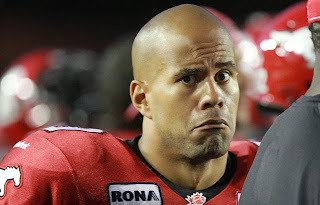 It’s time for our yearly ceremony to honour the best and worst of this past CFL season. There will be no actual award show as per usual because Man in the Bush spent the money that was set aside for the gala on volcano insurance. It’s really my fault for trusting him with the money… but we now have the distinction of being the only company in Saskatchewan that would benefit from the apocalypse. This year’s winners will receive a Hamilton Ticats 2013 Grey Cup Champion Hat from the shipment I managed to divert from its 3rd world destination (what are they going to do, call the cops?) and an autographed picture of the Rider Prophet to commemorate this occasion. 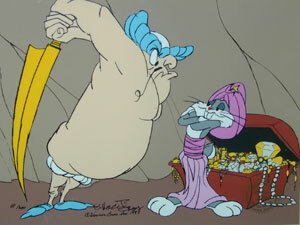 Honourbale mention to Hasan Hazime… mainly because he elicits childhood memories of this Looney Tunes character. However, this year’s clear winner is Argo O-lineman SirVincent Rogers. That’s not a typo, his first name is SirVincent. I guess his parents just went ahead and knighted him. Just ridiculous! Though it does make me wonder what would happen if he was actually knighted? Would he then be Sir SirVincent? And what if a man with a heavy southern accent was calling to the newly knighted Rogers? Then would he be "Sir I Say Sir Sir SirVincent". This one was great not just because Hervey pinned the collective failure of his crappy football team on one O-linemen. But also because “didn’t play another down this year” lasted just 2 weeks before Rottier was back as a fulltime starter. This quote wasn’t immediately funny but it became funny when the Offensive Coordinator (who was supposedly stripped of his playcalling according to Hervey) had no knowledge of this and planned to keep calling like normal and did. For a hugely flawed laying of the blame boosted by not actually following through on any of his ridiculous threats, Ed Hervey is the quote of the year. I am also partial to this one, not for comedic reasons but just for pure amazement. It’s pretty much a given by now that CFL reffing will have its foivals. It’s rare however that such foivals decide a game. It’s even rarer for one to decide a playoff game…. and it’s so rare that it never happens for the League to admit they were wrong. This year’s Botched call of the Year combines all 3 rare events into one. In the East Semi-Final with time winding down, the Als were driving for the potential game winning TD and a berth in the East final, Tory Smith threw a pass into the endzone towards Duran Carter. Carter was blatantly interfered with by Hamilton but the refs were obviously not wearing their zoomies and somehow missed it. It was so bad even the League had to admit the error, not that it was much consolation to the Als by then. Hands down, Zoomies! They make any TV a big screen for goodness sake! Where would we be without technology like this? You the fans have spoken and with 41% of the vote have made Jon Cornish the first person in the history of these awards to repeat as Douche Bag of the Year. Cornish must just give off a douchy vibe at all times because I didn’t think he did anything exceptionally douchy this year but this distinction is bestowed by you and you clearly think he’s a douche. One reader put it best when he said Cornish is a douche in an existential way. Odds of him three-peating are pretty good at this point. Usually there is a clear but winner to this award and my hatred list is well defined. This year with the team having so much success, there was far less hatred and insults being thrown around. A case could have been made for Dwight Anderson given his outburst that led to stupid penalties. But by Anderson standards he was pretty well behaved… at least on the field. That leaves only one guy who I consistently hated on and that’s Pat Neufeld. You all know I don’t think he deserves to ever be a starter. Him getting injured in training camp may have been the best thing ever for us as it allowed us to discover that Ben Heenan could actually be not just decent at tackle (which would have been a step up from Neufeld) but damn good at it. The brief time he was on the field for us was just awful, I think only Durant may have hated him more than me. At this point I will stop dumping on Neufeld though because he has already been punished sufficiently by being banished to Winnipeg. Good riddance.